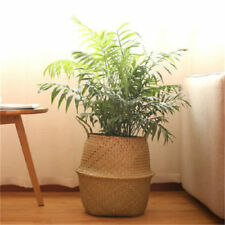 Item Type: Synthetic Rattan. Rattan Width: 8 mm. 1 x Rattan. Due to the difference between different monitors, the picture may not reflect the actual color of the item. Item Material: Polyethylene (PE). They make great centerpieces. plants in photo not included. Hope you can understanding, will be sincerely appreciated. Canada Rate (item arrived) 0.0% 47.1% 31.4% 17.6% 3.9%. Rate (item arrived). Condition : New (Handmade Products The workpiece and color may be different.). Material : Rattan. Color : Natural. You can also use them to flank a bigger piece of furniture. Until about 1980, tobacco baskets were used to carry and display tobacco taken to market. They could not only clean the air, but also decorate the room as well. A nice flower baskert is also necessary. - Multifunctional: it is an flower basket, but also is an storage basket. 1 x Flower Basket. 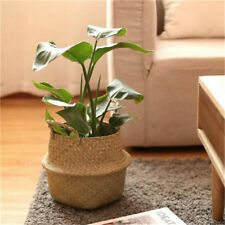 1 Piece Wicker Flower Basket. - Multi-purpose, garden flower basket, vase, bonsai holder, grocery baskets, plant pot covers, toy organizer, laundries, clothes basket, and etc. 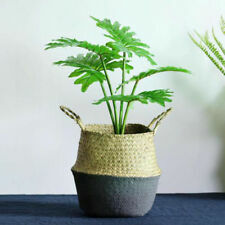 - Made of willow material, foldable strong and durable, with handles;. Pass UV test 3000H without broken and color fading.The thickness of rattan more than 1.3mm.2-3 years for common wicker, 5 years for import rattan. 1.100% polyester waterproof and quick dry fabric. High density foam with removable cushion cover for cleaning easily Color optional. Teddy Bear Wicker Basket Lined w Lid Rattan Hampers Kids Room Storage Brown 10"
Adults and chirldren can wear the headpiece because of its' flexible adjustable length and size. Floral quantity of a head wreath:9. 1x Floral Head Wreath. Occasions:Ideal for festival,Wedding,Garden party and many more ocassions. Quantity : 1 Box 3 Pcs. Color : As picture. 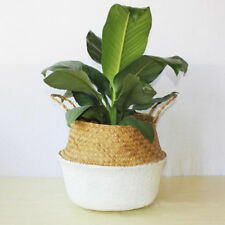 DO NOT expose to temperatures over 60 c.
Pair Of Oval Silver Willow Baskets Home Decor 12.5" and 15"
Pair Of Oval Silver Willow Baskets Home Decor 12.5" and 14.5"